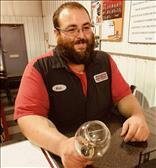 Walt is a lifelong resident of South Haven, Michigan and is a graduate of South Haven High School. 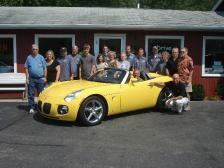 Walt started in the automobile business in 1974 and opened Walt Sicard Car Company in 1995. He received the prestigious State Quality Dealer Award from the Michigan Independent Automobile Dealers Association in 2004. Walt is very active in his community serving with various organizations and supporting local programs & events. Currently Walt serves as senior member for his church vestry and is a community director for Chemical Bank. He has served with the Boy Scouts in various capacities including many years as Scout Master of Troop 198. Walt is married to his wife Kathy for 35 years. Together they enjoy their three children, with a son-in law and daughter-in-law of which they take great pride. walt@waltsicard.com As you can see in this picture Walt has great enjoyment working at the Car Company and just never knows who will walk in or drive in next! Jeff moved from Caruthersville, Missouri to Southwest Michigan while in the eighth grade. 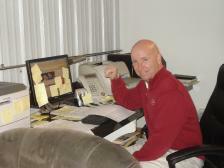 Jeff has become well known in the area and has been selling cars for over thirty years in South Haven, Michigan. Jeff enjoys a great repeat and referral business from his customers because offering a quality product and service after the sale has always been his way of doing business. Jeff loves sports and stays very active. He has officiated High School basketball for many years. When not at work you will most likely find Jeff training for a 10K or marathon, enjoying taking in a game or motoring up the Black River. Jeff is married to his wife Brenda for over 38 years and is father of two adult sons. He is also a proud grandfather to a couple of awesome grand kids. Matthew is a native of South Haven and grew up around cars and trucks helping his father and grandfather with their towing business at an early age. Matthew attended UNO, University of Northern Ohio Automotive College. Matthew will make sure your vehicle is properly serviced, tire pressures set, and inspected to make sure your car is ready to perform as expected when it leaves our shop. Matt has great attitude and is a real asset to our business as he always does his best to make sure our service to our customers is the best! Walt Sicard Car Company is a CAR FAX Advantage Dealer which means that we provide the security and peace of mind of having the best and most comprehensive vehicle history information available to you our valued customer. CAR FAX collects and reports information from service departments, insurance companies, auctions, and government agencies. You can access a free comprehensive Car Fax report on every vehicle we offer right from our web site or ask one of our sales professionals for a paper copy when you visit. 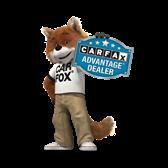 We are proud to have the Car Fox working with us for your benifit! Tom is a lifelong resident of South Haven. Tom is well known in the area having worked many years in the food business and most specifically as an owner with Maple Grove Grill. Tom enjoys a reputation for honesty and as a “straight shooter”. He is quick to make a friend and has quickly developed a good repeat customer following. Tom and Sandy his wife of 22 years have two fine sons. Tom enjoys sports of all kinds but favors baseball and has spent a great deal of time over the years coaching and assisting with his sons teams. Tom looks forward to helping you with your next vehicle purchase. 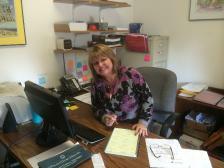 Meet Dorothy Lockwood, a lifelong resident of South Haven and the newest member of our sales team. Before joining the Car Company, Dorothy served as Branch Manager for Chemical Bank Suburban and has over 20 years’ experience in the banking industry. Dorothy loves people, loves cars and brings a wealth of knowledge of financing to help her customers find the vehicle that’s perfectly right for them! Dorothy has been married for 35 years. She and her husband Dave are both very involved in our community and value the integrity and reputation of the Walt Sicard Car Company. You may recognize Dorothy from her volunteer work with the Rotary Club of South Haven, and St. Basil’s Church. Dorothy and Dave have two adult children, Eric (Jessica) and Angela. They also have two picture perfect granddaughters who refer to her as GiGi. Their family also cherishes an Irish-doodle named Scarlet. Dorothy is always eager to welcome new customers as well as those long known and appreciates the opportunity to show our nice vehicles, assist with a test drive or just chat about how she can help. Stop in or give Dorothy a call today! Yes Pebbles is her real name! Pebbles has been leading our detail team for many years and more recently also manages our fleet of daily rental vehicles. She is the one to call to schedule a rental car, or a complete detail or simple in and out wash for your vehicle. Pebbles has a caring heart and will do whatever is within her power to make sure our cars are clean and our customers are happy. Pebbles and her husband recently became proud grandparents to a very happy and handsome grandson! When you enter our service department either by phone or through the front door, Johnnie Phillips is probably the first person you will speak with or see. She keeps us up to date with appointments, parts orders, billing and cashiering, and many other things to make sure the shop operates smoothly. A life-long South Haven resident and graduate of South Haven High School. Johnnie and her husband Tracy are parents to two lovely daughters. Give Johnnie a call today to schedule your next oil & filter change which comes with a nice full vehicle inspection at no extra cost. Timothy hails from the Casco township area. He grew up farming with his family and while being around tractors and equipment Timothy gained a love for all things mechanical from an early age. Timothy is a graduate of the Automotive Technical School of Grand Rapids Community College and has worked with us for over 10 years. 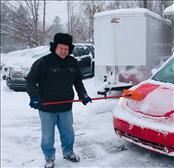 Timothy holds ASA Certifications and is a State Master Certified Technician. Besides being an extremely hard worker Timothy is a joy to have in the shop. He has become our go-to for the really difficult to diagnose times and continually works at becoming the best. Heather is a graduate of South Haven High School and currently is attending Lake Michigan College specializing in welding. She is a great help to us and our customers with her caring and happy attitude. She is great at keeping our shop neat and clean and at lending a extra hand to one of our techs. She is also available to help our customers with a ride home or to work when dropping off a vehicle for service. From the moment you step on our lot until the time you drive away in your next car, your buying experience with Walt Sicard Car Company is our number one priority. We encourage you to use the expertise and resources of our sales staff; they are here to help you find the right car at the right price. Call us today at 269-639-2277 to schedule your test drive! Dustin has been with Walt Sicard Car Company since 2015 and is currently continuing his education with Kalamazoo Community College. He has certifications in many areas and is working toward his Master Certification. Dustin is a very conscientious young man and always strives to give great service and the highest caliber of workmanship with every assignment and job. We are fortunate to have Dustin on our team. Tracy is a life-long resident of South Haven and has over 30 years of experience in automobile mechanics. Master Certified, Tracy is well known in the area as one of the best and brings a wealth of knowledge and talent to our team. 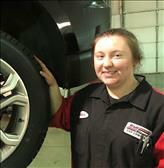 Tracy joined Walt Sicard Car Company shortly after we opened our Tire & Service Center and is a welcomed addition. You'll find Tracy and his wife Debbie hitting the roads in their motorhome or on their Harley-Davidsons' whenever they can get away. Andrew Warren is a fine young man and has been a part of our company for over 6 years. Andrew stays busy as he is enrolled in seminary to become a Baptist pastor. Andrew does a great job putting a shine on our vehicles and helping us make sure our cars are ready for delivery. He also helps a great deal with getting our service customers and their vehicles where they need to be on time. Ross & Alice are a great team and can be found running for us from morning till night as business necessitates. From bringing inventory in and out, to giving customers rides to work or home, to making trips to the Secretary of State's office or running for parts. Ross and his wife Alice have been married for over 51 years and are great assets to our business. They are long time South Haven Folks who love the lake and trips on his big Honda motorcycle.